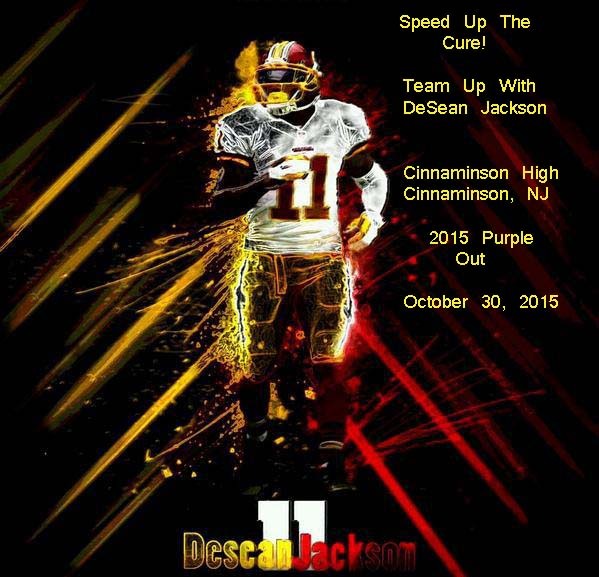 Cinnaminson High School, a four-year public high school, of Cinnaminson Township in Burlington County, New Jersey, will be teamed up with the DeSean Jackson Foundation (DJF), on October 30th to host its 2015 inaugural “Purple Out” to raise Pancreatic Awareness. The DeSean Jackson Foundation was founded by former Philadelphia Eagle and present Washington Redskins’ wide receiver, DeSean Jackson, and his mother, Gayle, in 2009, after DeSean’s father, William “Bill” Jackson died from Pancreatic Cancer five (5) months after being diagnosed. 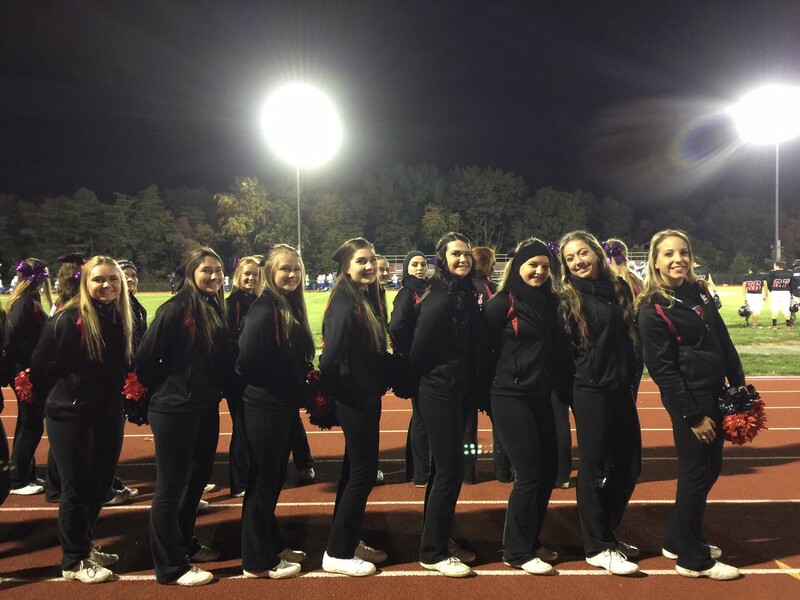 Michele Iaconelli, Cinnaminson High School, English and Psychology teacher, states, “We were so excited to host a “Purple Out” at our home football game with Burlington City, on October 30th. The cheerleaders wore purple bows and the football players wore purple sweat bands on their wrists. 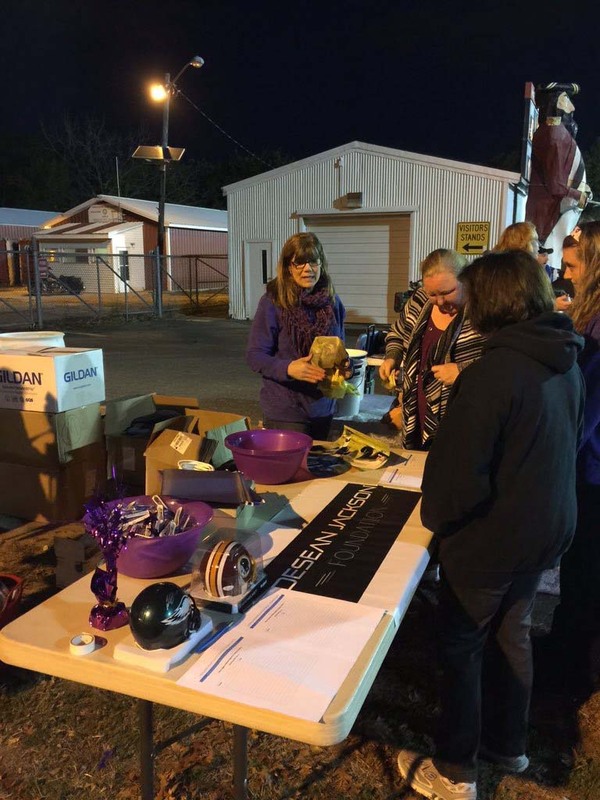 In addition, we had purple leis for the band members to wear; and, purple ribbon bandannas to sell to raise donations for Pancreatic Cancer Awareness. 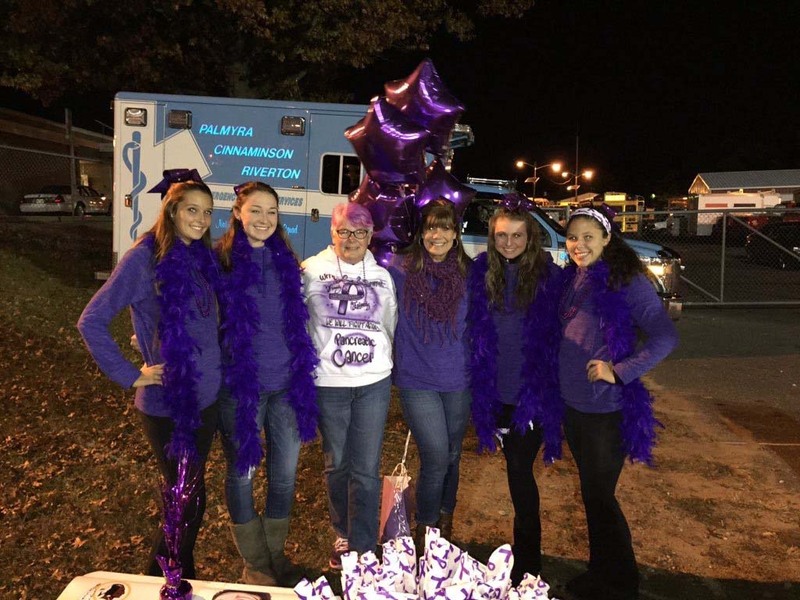 The Student Council officers also walked around the stands wearing purple”. 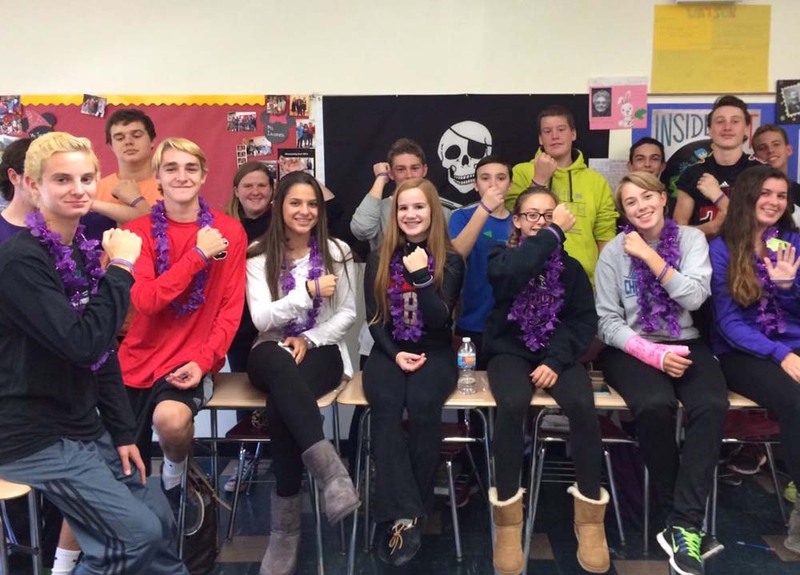 “Purple Out” is a national initiative that was developed by the DeSean Jackson Foundation in partnership with the faculty and students at Andrew G. Schmidt Middle School, Fenton, Michigan that empowers students to be change agents by advocating for Pancreatic Awareness, crucial funding for research; and, petitioning the NFL for an annual “Purple Out”. DeSean and Gayle Jackson cultivated a culture that encourages the youth to utilize DeSean’s national platform as an elite, professional athlete to “Be the Change You Want to See in the World” by teaming up with DeSean. “One Team, One Purpose” is DeSean’s concept for mobilizing youth across the nation regardless of their NFL team affiliation to join the Jackson family in this fight. 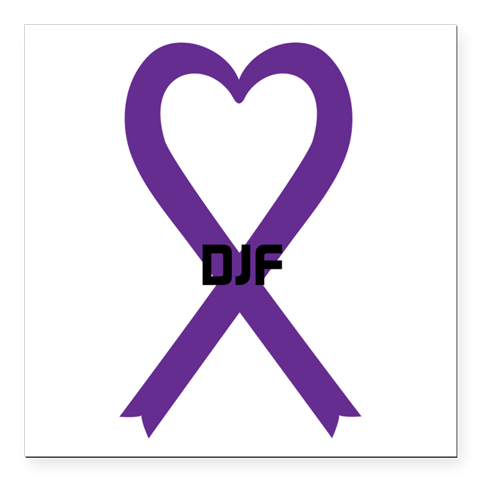 Pancreatic Cancer is the 4th leading cause of cancer-related death for both men and omen in the United States, and its the 11th most commonly diagnosed cancer in men and 8th in women. In 2015, 48,960 Americans will be diagnosed with Pancreatic Cancer and 40,560 will die from this disease. Seventy-two percent (72%) of patients will die within the first year of diagnosis. African-Americans have the highest incidence rate of Pancreatic Cancer, between 31% and 65% higher than the incidence for other racial/ethnic groups. Pancreatic Cancer is very aggressive; there are no early detection methods; and, there is no cure. Media Contact: Michele Iaconelli, Cinnaminson High School, 856-829-7770.